In-flight portrait of STS 61-C crew. 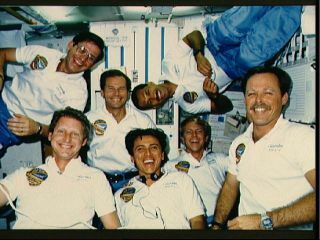 Astronaut Robert L. Gibson (lower right corner), mission commander, is surrounded by fellow crewmembers, counter-clockwise from upper right: Astronaut Charles F. Bolden, pilot; U.S. Representative Bill Nelson (D.-Florida), and Robert J. Cenker, RCA, both payload specialists; and Astronauts Steven A. Hawley, Franklin R. Chang-Diaz and George D. Nelson -- all mission specialists. WASHINGTON – U.S. Sen. Bill Nelson hosted a 25th reunion of the Columbia shuttle crew he joined during a weekend of celebrating their giddy success while also somberly reflecting on the dangers of human spaceflight. The Orlando Democrat hosted crew members for a dinner at his home Saturday. He then led them on a Sunday tour of the Capitol, with a pause for a moment of silence at a first-floor painting of the crew of shuttle Challenger, which blew up 10 days after Nelson's flight landed. "That's what makes us gathering up all the more special to me," Nelson said. More recent concerns also intruded. Crew members and their wives planned a private memorial service at chapel near the Rotunda for Rep. Gabrielle Giffords, D-Ariz., who is recovering from being shot in a Jan. 8 rampage that killed six and injured more than a dozen. Giffords headed the NASA subcommittee last Congress and her husband is Mark Kelly, an astronaut veteran of three shuttle flights who was named to command the next one. Mark Kelly's twin brother Scott Kelly is aboard the International Space Station. "All of us want to extend our sympathies to those who were lost in Tucson, and particularly to Congresswoman Gabrielle Giffords and her family and the other survivors because again that impacted the space community because of Gabby's relationship to the community," said NASA Administrator Charles Bolden, who flew four shuttle missions, including the one with Nelson. Besides dinner and the Capitol tour, the crew members planned to visit the Smithsonian Institution's portion of the Air and Space Museum that restores spacecraft for public display. The group also planned a tour of the White House's West Wing. "I'm just thrilled as you might be able to say," said Robert "Hoot" Gibson, the flight's commander and a veteran of five shuttle missions. "I'm smiling from ear to ear." NASA will spend the week commemorating the Challenger and the first Apollo flight. Bolden said the agency strives to make spaceflight safer, but more always remains to be done. "I think as we saw with Challenger and Columbia, our nation is pretty strong and strident when it comes to its desire to explore," Bolden said. "My hope is that this week of commemoration will remind us why we do what we do and make us even stronger in our dedication to putting together a robust exploration program." Dr. Franklin Chang-Diaz, who now heads a private company, Ad Astra Rocket Co., that is developing a plasma rocket that may one day carry people to Mars. Steven Hawley, an astronomy professor at the University of Kansas. George "Pinky" Nelson, who directs a math program at Western Washington University. Robert Cenker, a retired engineer. Published under license from FLORIDA TODAY. Copyright © 2010 FLORIDA TODAY. No portion of this material may be reproduced in any way without the written consent of FLORIDA TODAY.